Follow me closely on this. My Throwback post for Netflix Canada this month is a documentary released in theatres/for purchase earlier this year and is now streaming on Netflix as of TODAY. It tells the humble beginnings of the Boys whose posters covered my walls in high school and whose CDs had a permanent place in my Discman from 1995 until I got an iPod. I dressed up like one for Halloween when I was 16. I've travelled to Winnipeg, Detroit and Buffalo to see them, and have seen them in Toronto so many times I've lost count. My daughter was even born on my favourite band member's birthday. If you knew me personally, you'd know I'm talking about the Backstreet Boys. 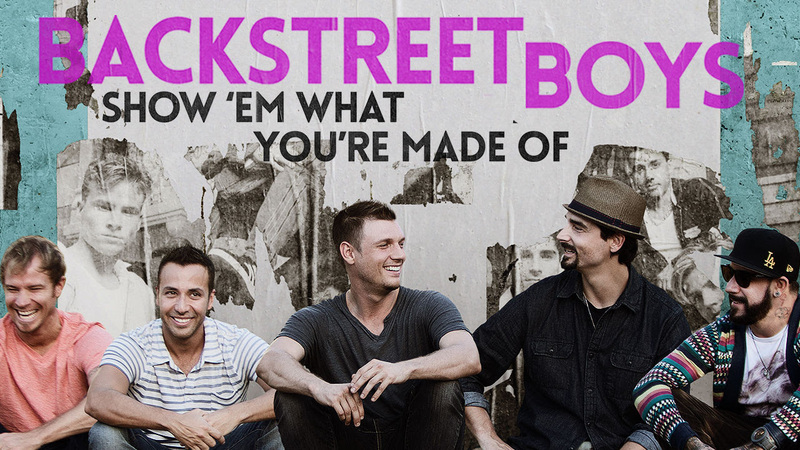 And today their documentary, Backstreet Boys: Show 'Em What You're Made Of is streaming on Netflix Canada. For perhaps those who aren't obsessed like me (I saw it in a special theatre screening in Toronto on Jan. 29th, and totally downloaded it the next day when it hit iTunes), but curious enough to watch, this is definitely a documentary that doesn't disappoint. The documentary captures the "Boys" making their latest studio album and each returning to their hometowns to share that moment when someone took notice of their talent and encouraged them to move forward with it. It covers with their beginnings as a boy band, their dominance in the 90s, their disappearance from the music scene, their resurfacing and of course Kevin leaving the band (that's the one with the thick eyebrows if you were wondering). There are tears, fights and of course a lot of singing. Even from watching the trailer and following them for years, I was beyond surprised to see who fights. Even if you're not a mega fan like me, or even if you change the station when their songs come on, give this documentary a chance. After all, the men dragged to my special screening left in one piece and even learned how to ask for "favours" in German. Let me know what you think of the documentary below!